This gold tone tie bar was a promotional gift from Hyundai Electronics. ​It features an actual Hyundai Electronics 16M DRAM memory chip. 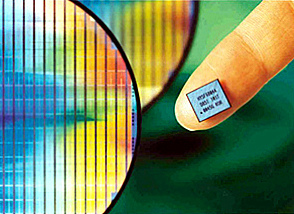 Hyundai first entered the computer memory chip business in 1983. During the 1980's, Hyundai would have OEM contracts to second source memory chips for Texas Instruments, Intel, and General Instruments. Starting in 1993, Hyundai and Fujitsu would form an alliance, sharing DRAM memory development and manufacturing technologies. Hyundai would even use Fujitsu's manufacturing plants in the United States to produce their DRAM chips while competing for market share with their main rival Toshiba. Hitachi would also form an alliance with Korean DRAM maker, Goldstar Electron, to speed up development of the 4M & 16M DRAM memory chips. 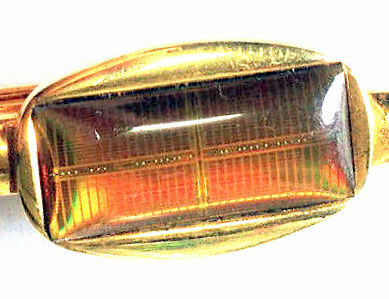 Item is marked "24KGF" & "HYUNDAI 16M DRAM" on the back. Measures 2 1/4" wide x 1/2" tall.